Summary from Goodreads: Jason has a problem. He doesn’t remember anything before waking up on a school bus holding hands with a girl. Apparently she’s his girlfriend Piper, his best friend is a kid named Leo, and they’re all students in the Wilderness School, a boarding school for “bad kids.” What he did to end up here, Jason has no idea—except that everything seems very wrong. Piper has a secret. Her father has been missing for three days, and her vivid nightmares reveal that he’s in terrible danger. Now her boyfriend doesn’t recognize her, and when a freak storm and strange creatures attack during a school field trip, she, Jason, and Leo are whisked away to someplace called Camp Half-Blood. What is going on? Leo has a way with tools. His new cabin at Camp Half-Blood is filled with them. Seriously, the place beats Wilderness School hands down, with its weapons training, monsters, and fine-looking girls. What’s troubling is the curse everyone keeps talking about, and that a camper’s gone missing. Weirdest of all, his bunkmates insist they are all—including Leo—related to a god. We get not one, but two books by Rick Riordan this year! I was very excited about The Red Pyramid, the start to a new series about Egypt and its gods. But, to be honest, I missed Camp Half-Blood a little, so I'm happy that we get to go back and experience it again with some new characters. What is your Waiting on Wednesday pick? I don't know how it is possible, but I did not know of this one! Thanks for sharing! This sounds like a great read. I haven't read anything by this author, but I will have to look in this! wow, another book this year? about a different serie? Great! This one should be a hit for sure!!! I want to read this too, but should prolly finish the Percy Jackson series first! I want this too, just as soon as I finish Percy Jackson series. :) My WOW is at The Crowded Leaf. I have a ton of middle school Percy Jackson fans who will be excited to see this one! This sounds fantastic! 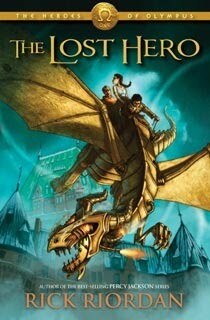 I loved the Percy Jackson series and it will be really nice to return to Camp Half Blood. Great pick! I need to read something by this author!! great pick! cant wait for this one either ;) loved the percy jackson series!